What room do we use to listen to our scanners? Mainly in my living room but I can take it portable if the need arises. My living room and bedroom. I also slip one inside my jacket and listen on the move while cycling, via mobile phone earphones. I also carry a Retevis RT3 and give my dearly beloved a shout when I'm heading home. Most rooms, I have a dongle & a AirNav RadarBox connected to the PC in my lounge & a GRE-PSR-295 sitting on the printer. I have a Uniden 3500 & a 230 sitting in the kitchen for when I go out. I have a old GRE scanner & a Uniden 15X beside the bed & several old Realsitic/GRE's in my bedside draws. I also have my main shack in the bedroom. My wife is also licenced. Among the shacks radios I have a Trio QR666 SWL radio which I have owned since about 1980, an Eton G3 portable SWL radio with Airband on it & a small loop antenna. An Icom VHF/UHF base RX, a Realistic 2006 & a few other old radios & bits that I have collected down the years, including a ULF RX only transverter. On the TX side I have various HF TX's, including an old free radio 200 watt Medium Wave TX, that currently has a top band crystal in it, so I can/could, use it on top band AM, if I ever choose too. I also have some VHF & UHF radios including several old PYE's. 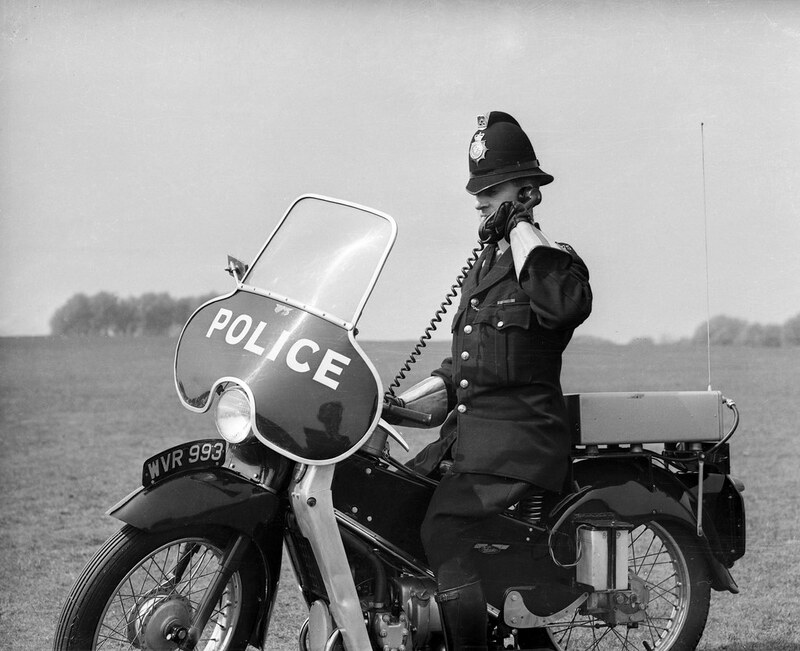 I own a 1959 ex Police Velocette LE motorcycle & have an ex Fire Brigade (70MHz) PYE, which obviously works great on 4 meters. Car wise, I just use a handheld radio, or a temporary fit amateur radio set, with an antenna on single or triple mag mount, depending upon antenna in use. To be honest, I have piles of old radios & equipment. Including my first ever handheld scanner, which is a Uniden 10 channel scanner. 50XL? It covers very little spectrum & only shows channel number not frequency. It really is VERY basic. Thanks for all the replies,I am planning to put up an outside antenna route the cable down to outside my kitchen the drill a hole and put a surface mounted box with a female BNC surface mounted socket,then make a lead to connect my UBC125XLT. What are your thoughts? Hello – What make/type of antenna will you be using? Only asking as I have been using a Scanmaster Airmaster installed as high as possible on the roof of the house for over a year with good results. I have since changed my antenna for a D777 thinking it would increase range and reception quality. I initially positioned the D777 about 3m lower than where it should be and was surprised that I picked up French ATC and pilots reasonably well. I have since increased the height a metre or so thinking it would continue to improve reception only to find that I can no longer hear French ATC. I was of the understanding that having your antenna as high as possible was an essential requirement, perhaps someone could advise on this. I'm keen to test other antenna types and looking to try a dipole antenna to see how that performs. BTW I have the same scanner (UBC125XLT) it works very well. skyhigh wrote: I initially positioned the D777 about 3m lower than where it should be and was surprised that I picked up French ATC and pilots reasonably well. I have since increased the height a metre or so thinking it would continue to improve reception only to find that I can no longer hear French ATC. Height is King. But a King still needs others to rule effectively. As an example of how position can effect what is& is not heard. A friend of mine can operate his local VHF repeater perfectly from the road outside his home & from his drive as long as his front bumper is almost touching his garage door. But as soon as his cars front wheel touches the pavement in front of his house, until he is hard up against his garage door he gets nothing. A matter of inches horizontally can make a big difference in what is in the clear & what is not. However a few feet of altitude on a antenna gets a great signal again. But that is not always the case, sometimes it can take a small movement left of right, than vertically to get the signal back again. I would imagine your issue is not height. But how the antenna has moved on the horizontal plane. VHF signals are badly effected by obstructions like land rises, buildings, trees, especially if those trees are in leaf or even more so, if those leaves are wet. So although height gives you a longer distance to the horizon, normally. Sometimes a lower height, a few feet to the left or right on a certain signal path, may give the best signals for that particular signal. @m0lsx – Thanks for the reply, it’s an interesting challenge indeed. I have made subtle adjustments both “up and down” without any noticeable improvements sadly, but will persevere of course. On airband the only real difference the height of your antenna will make, is with ground stations. The aircraft are at height. So a few feet, or even meters, makes little difference at the receiving station. Okay thanks, improving reception and range with respect to “ground stations” would be good. I have the opportunity to increase the height of my antenna by at least a couple of metres, so I’m planning to do that in the future.